Reading your team members can help create a harmonious facility, and in business, reading your audience is critical to your professional success. This ability has long been a secret of the magician’s success. Magicians are astutely skilled in the fine art of perception and recognizing the individual personalities that comprise their audience. ♦ There’s the excited participant, ready to be blown away by anything. ♥ There’s the passive viewer, who is enjoying the show, hoping that they don’t get picked. ♠ There’s the take charge A-type that wants to take control of the situation. ♣ There’s the skeptical know-it-all who has to figure out the secret. ♦ The Diamonds are shiny and exciting; they yearn to be seen and recognized. ♥ The Hearts are compassionate and loving; they wish for everyone to get along. ♠ The Spades are quick and strong; they want power and control. ♣ The Clubs are very specific; they require attention to detail to be right. Once you know which four personality styles align with which suits, you’ll want an easy system to identify which person is exhibiting the behaviors of which suit. To do that, you just need to pay attention to a person’s speed and temperature. What’s amazing about the four suits of a deck of playing cards is that their color and shape connect to a person’s speed or temperature. First, think of the color of the suits—red or black. When you meet people for the first time, if upon introducing yourself they are open and engaged, they are most likely a red suit—a warm Heart or a Diamond. If they are reserved or withdrawn—acting colder towards you —they are a Spade or Club. Next, think of the shape of the suits. The Diamonds and Spades have sharp and pointy ends—they move fast and talk fast, just like their edges are fast to draw. They go for the straight line of the situation, they get to the sharp end of the point! So if someone you meet is moving and talking fast, they are a Diamond or a Spade. Hearts and Clubs are round suits. These people can’t be rushed or pushed to making a decision. They need time. The best way to remember the Clubs is that this suit is very difficult to draw; it requires attention to detail to do it right. So people who are critical, detailed and disciplined — people who require being right — are Clubs. See how easy it becomes? Just pay attention to how fast/slow and warm/cold someone is. With two questions you’ll have a strong sense of which suit best describes the personality. If you’ve studied other personality evaluation systems you can overlay the four suits over the terms you already know. The four suits make memory recall easier, helping you speed up the entire identifying process. They are a shortcut for your mind. Depending on your own personality, you may think that this is amazing ♦, or this is all obvious to you ♣. Maybe you’re curious how this will affect others ♥, or maybe you’re ready to put thoughts into actions ♠. If you meet a ♦, provide recognition and attention. If you meet a ♥, provide support and approval. If you meet a ♠, provide opportunities to take charge and make decisions. 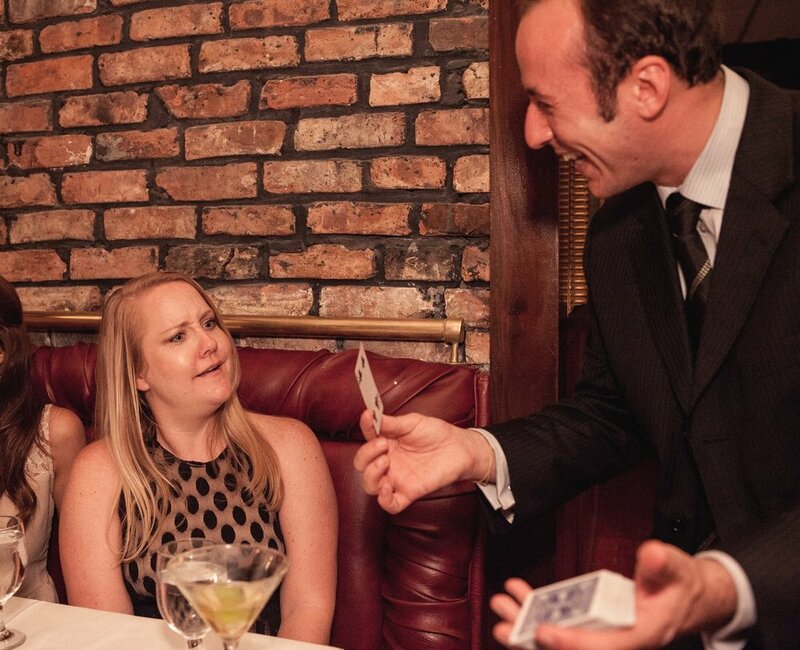 A great magician provides each of the personalities exactly what they need. For example, he allows the ♣ to analyze whether it’s a regular deck of cards. He then lets the ♠ decide which card to select by authoritatively shouting “stop!” And he invites the ♦ on-stage to receive the attention and credit for seemingly making the magic happen. All the while, he leaves the ♥ alone to take pleasure in watching others enjoy themselves. Once you’re aware of what each suit needs, you, too, can provide each person the right opportunities to thrive, just like a magician. Many people have taken personality tests to tell them who they are. But very few people can instantly assess the personality style of someone they meet. Thanks to this magical system, you’re now equipped to do just that. You don’t have to rack your brain to search for the right word to describe someone. The magician’s method of four suits is simple to learn and easy to use in the real world. When you’re in the trenches of a presentation or negotiation, meeting people and trying to understand them on the fly, utilize the four suits to identify personality types quickly and easily. And then, give them what their suit needs. The goal is for you to eventually be able to identify the personality styles without even thinking about doing it. Mastering this skill will enable you to be more adaptive to your audience—just like a magician. That will go a long way to help you build that relationship or close that deal.